Who Gets A Sunburn In January!? Who gets a sunburn in January? I do, that’s who. 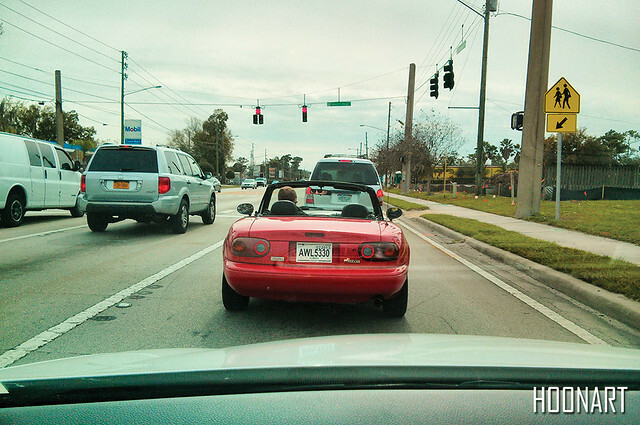 This morning we drove out to pick up our new (to us) Miata and I refused to be dissuaded from driving with the top down all the way home… for an hour and a half… on the interstate in low sixty degree weather. Here are some photos that my wife took along the way. We picked up the car this morning (technically yesterday on the East coast now) and took it around the corner to fill it up. 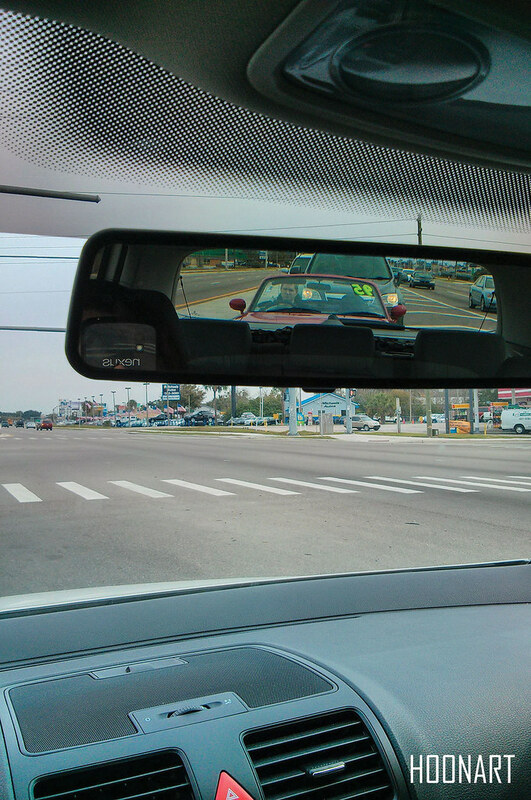 The difference in size between our two cars was a bit shocking. I mean, I knew a Miata was small, but it makes our Rabbit look like a minivan and I’d always thought of the Rabbit as a small car too. I looked like a guy riding in a roller skate. It’s the pink bluetooth headset that really brings it all together. Waiting at a light on the way home from work this evening. 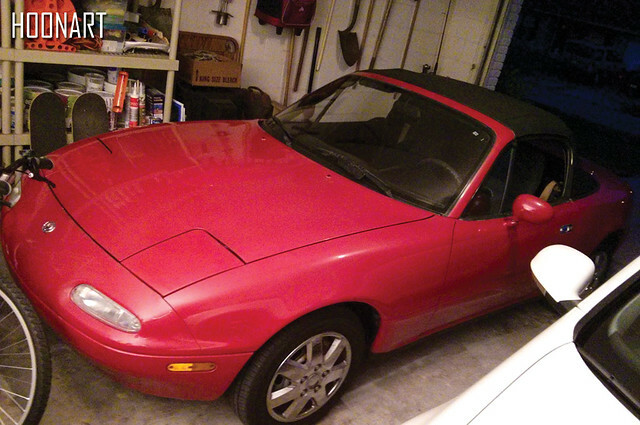 In it’s new home in the garage tonight. I got the garage cleaned up pretty well last night. Didn’t sleep too well afterward but it was worth it. 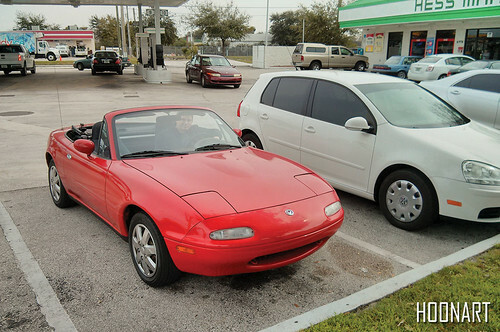 Well, in case you missed the big update and announcement in the previous post, I just purchased this 1995 Mazda Miata and am going to be fixing it up. Special thanks go out to my wife Nina for helping to make this happen. And also thank you again to John Louros and John Stasny for the helpful advice. I am now really exhausted and for some reason I have a big vein sticking out of the side of my eye, so I will leave you for now and say goodnight. Definitely! It looks like some pieces were missing behind the front bumper of that other one we checked out. Lose those awful wheel covers if you haven’t already. Started checking autocross calendars yet? Thanks, geist! Yeah, when I get home the cleaning will begin starting with those wheel covers. I haven’t checked the calendars yet, but as soon as I’m able to confirm good compression and timing belt, it will be on the agenda for sure. Congrats, looks like you didn’t need to shop around too long! 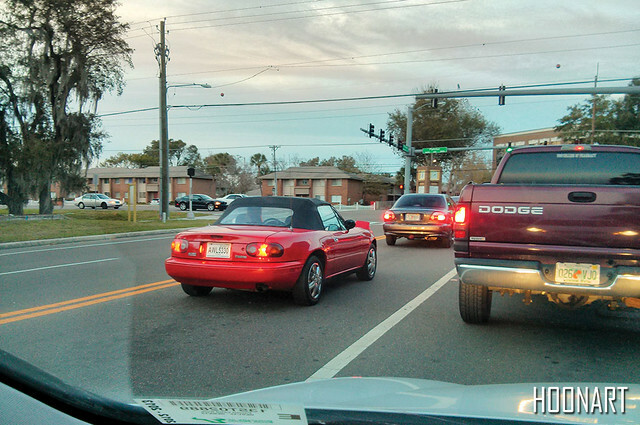 I have heard that ’94-97 is the best years for the Miata. But man you gotta do something about those wheels! Thank you! I’ve been looking online for a few months but yeah, not much test driving. For the wheels, I’m thinking that I’ll toss the wheel covers and rattle can the steelies a nice and even color. Maybe black, maybe silver, maybe even white. I really wanted something between ’94 and ’97 because I wanted the original body with the slightly quicker engine. Most of them in my area are either still too high priced or complete wrecks. So I knew I might have to do some work on it, but everything works. Black painted steelies are cool, maybe white… silver might be a bit too generic looking. To me, the best looking wheels on that body style is the factory OEM 8-spoke 15s. I agree. Probably black for now. White would be really difficult to keep clean. I’ve always liked the daisy wheels because they reminded me of old banana spokes. I have a thing for old Japanese wheels.